Ok, that was a bad joke. Hey, I’m no Robin Williams. Some people have the knack of being able to make people laugh in almost any situation. I can get a few laughs, but I’m not a naturally gifted comic. Dr Caroline Leaf is a communication pathologist and a self-titled cognitive neuroscientist. She isn’t a comedian either. 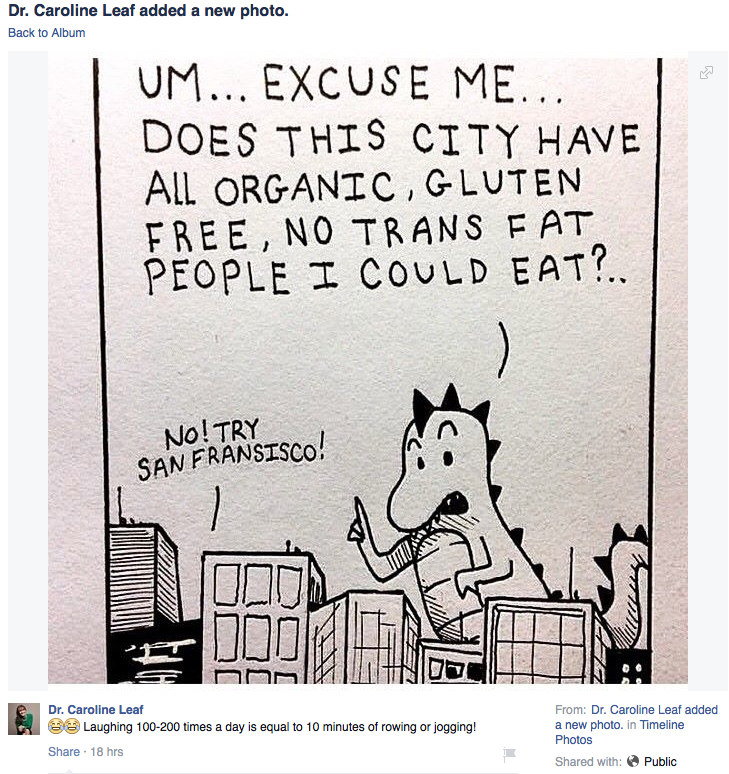 Her post today was a light-hearted dig at giant lizards with a taste for organic free-range humans, or perhaps the fact that most people know being “all organic, gluten free” should be left to the sanctimonious foodies of San Francisco. Not according to real scientists, who have worked out that laughing is actually the metabolic equivalent to sitting still at rest, while jogging or rowing burns between 6 to 23 times as much energy, depending on how fast you run or row . That would mean that I would have to laugh for at least a whole hour a day (or about 700 times based on the average chortle) to be even close to the energy burnt by a light jog. On the grand scale of things, this meme probably doesn’t really matter. These sort of factoids are thrown around on social media all the time, and it won’t make a big difference to the health and wellbeing of most people. But it does help establish a pattern. Dr Leaf habitually publishes memes and factoids that clearly deviate from the scientific truth, proving that Dr Leaf has become a cross between a science fiction author and life coach, not a credible scientific expert. From her social media memes to her TV shows, all of her teaching becomes tainted as untrustworthy. While today’s meme may not be so serious, if Dr Leaf can’t get her facts straight, pretty soon the joke will be on her. This entry was posted in Biological, Caroline Leaf and tagged caroline leaf, cognitive neuroscientist, dr caroline leaf, Facebook, factoid, jogging, laughter, meme, metabolic equivalent, pseudoscience, robin williams, rowing by cedwardpitt. Bookmark the permalink. Hi Dr Johnson, thanks for taking the time to seek clarification. Your question is a legitimate and important one. While it’s true that the most consistently popular posts on my blog are concerning Dr Leaf, when I actually counted up how many posts were related to Dr Leaf’s teaching, it was less than 60%. The reasons for my strong focus on Dr Leaf are probably better explained in more depth by the outline and preface of my critical analysis of the work of Dr Leaf (iBooks = https://itunes.apple.com/us/book/hold-that-thought/id908877288?mt=11 or Smashwords = https://www.smashwords.com/books/view/466848). Further, my blog has been the best medium for discussion on Dr Leaf’s teaching. In the past, I have attempted to engage with Dr Leaf directly and through her Facebook page. Unfortunately this resulted in nothing more than a dismissive reply from her husband (https://cedwardpitt.com/2013/08/29/mac-leaf-responds-to-dr-caroline-leaf-serious-questions-few-answers/), and being blocked from her Facebook page. Dr Leaf’s censorship left me with no avenue, other than my blog, to express my concerns about her teaching. Let me state, for the record, I have never met Dr Leaf. I do not have anything against her personally. I do not have a personal vendetta against her, nor am I out to destroy her ministry. I do not have any financial interest – I do not charge for my book, nor do I accept advertising on my blog (WordPress sometimes puts ads on the blog, but I don’t receive any revenue from this). My sole intention is to present an alternative view to Dr Leaf’s teaching so others can make up their own mind. If I have enabled others to make an informed choice on the validity of Dr Leaf’s teaching then I have done my job. Again, thanks for seeking clarification.